Thunder In The Night: Is breast best? My work colleauge brought her wee baby boy into work today and dumped Dylan on my lap while she had a chat to our manager. 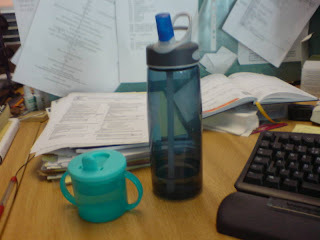 She also dumped his Tommy Tipee mug on my desk, right next to my Camelback bottle. The similarites were uncanny. I remembered someone saying that they didn't use Camelback drinking systems anymore as he'd "Grown out of sucking my Ma's teat years ago". I say, who are we to argue with nature. Breast is most definately best.